The details of these operations are described vividly, even passionately. Morison spares no information in describing the grim consequences of the kamikaze suicide crashes by enemy planes on the radar picket destroyers and other ships. With his usual clarity and skill, Morison describes the strategy that led to the concluding campaigns of the war and to the dropping of the first atomic bombs. 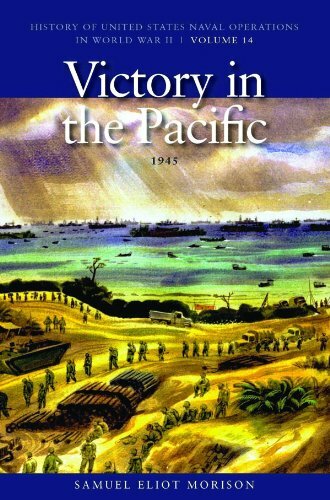 Additional chapters are devoted to the logistics problem of supplying fleets and armies thousands of miles from bases to the devastating prowls by Pacific Fleet submarines, and to the controversial loss of the Indianapolis. Of particular interest is his detailed account, from Japanese and American sources, of the delicate negotiations which led to the surrender of Japan. About the Author Samuel Eliot Morison, an eminent Harvard professor, was appointed by close friend Franklin D. Roosevelt to write the history of U.S. naval operations during World War II after convincing the president that too many wartime histories were written after the fact or from a distance. Morison called his classic work a"shooting history" of World War II, because it was documented by historical observation during each specific naval operation in the Atlantic and Pacific. Hailed for its accuracy, narrative pace and detail, this monumental work presents a complete record of the U.S. Navy's war at sea, covering the strategic planning, battle tactics, and technological advances, as well as the heroic actions of American sailors. Samuel Eliot Morison was born in Boston, Massachusetts, on 9 July 1887. He attended Harvard University, from which he was graduated with a Bachelor of Arts Degree in 1908. He studied at the Ecole Libre des Sciences Politiques, Paris, France, in 1908-1909, and returned to Harvard for postgraduate work, receiving the degree of Doctor of Philosophy in 1912. Thereafter he became Instructor, first at the University of California in Berkeley, and in 1915 at Harvard. Except for three years (1922-1925) when he was Harmsworth Professor of American History at Oxford, England, and his periods of active duty during both World Wars, he remained continuously at Harvard University as lecturer and professor until his retirement in 1955.